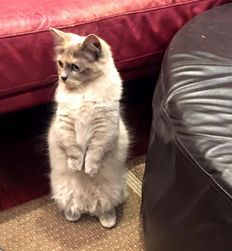 Welcome to Short-N-Sweet, home of the rare dwarf cat breeds of Munchkin and Skookums. Mucnhkins are sometimes referred to as the "dachshund of the cat world" . Skookums were developed by crossing a munchkin to a laperm (curly coated Rex breed). The curls of the skookum coat tend to hold in the loose hair and dander so are an option for some munchkin lovers with allergies. Short-N-Sweet Cattery is located in Mackay, QLD Australia. I'm a registered breeders with AICC. I first fell in love with munchkins in 2007 and it took a few years to be lucky enough to become involved in the future of this wonderful cat. 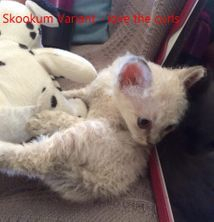 My first skookums were imported from New Zealand in early 2015 and I thank the breeders for entrusting me with these unique cats - as of 2015 we are the only breeder of skookums in Australia. My goal is to breed healthy, happy kittens to standard. With the dwarf breeds every litter is different and can you can get a mix of standard short legs (munchkins) and the non-standard long legs born (Stiltskins) and curly coat shortlegs (skookums) and long leg curly coats ( skookum variants). I will be focusing on producing chocolates, dilutes, silver and mink in varying patterns including colourpoint and bicolours. I aim to provide quality kittens whom will give a lifetime of joy and happiness to their owners. Please feel free to contact us if you have any questions. We also have a facebook page Short-N-Sweet munchkins and welcome everyone to join, to get your regular pic fix.